Plasma shape material-division | BRAVO Loštice spol. s r. o. The plasma material-division in Bravo Loštice Ltd. is done by a modern machinery developed by CEBORA company. 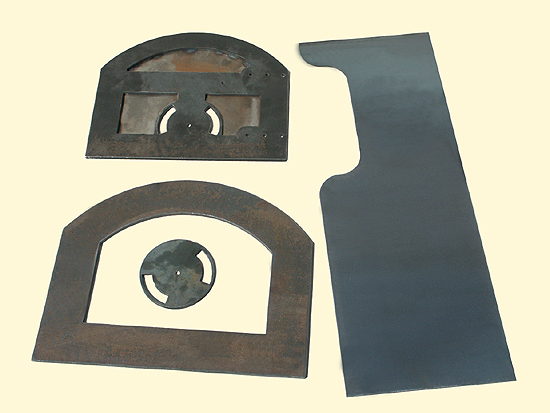 It is possible to cut common kinds of steel, different kinds of products up to 20 mm thickness and the parting cuts can be performed. There is a high accuracy of the cut in this method, for the shape material-division guaranteed up to ± 0.5 mm and for the parting cuts guaranteed up to ± 1 mm. 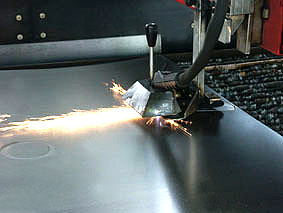 The size of the cutting table is 1500 x 2000 mm. The cut is controlled by the attached personal computer, individual engeneering drawings could be uploaded into the system as *.dxf files (AutoCad format). There are several types of plasma based on different kinds of gas, e.g. monoatomic hydrogen, diatomic hydrogen, oxigen and the air. This plasma gases ionize through their energy the plasma arc. There are big energies released from the recombination of atoms and molecules and immense heat effect of the plasma beam is created, which works upon the cutted material. Usualy the plasma beam is cooled by a water pipe. Using this approach the baem can reach energies around 2*10^6 W/cm^2. Because of the high temperature the plasma expands and flows towards the cathode. 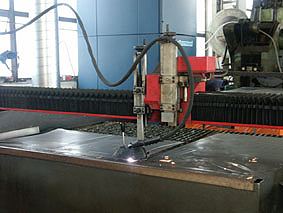 There is a temperature around 30,000 °C in the plasma arc, which together with a high kinethic energy of the plasma beam gives a very high cutting speed, which is dependent on the shaped material thickness. The arc between the jet and the cathode is set on fire by high voltage circuit.